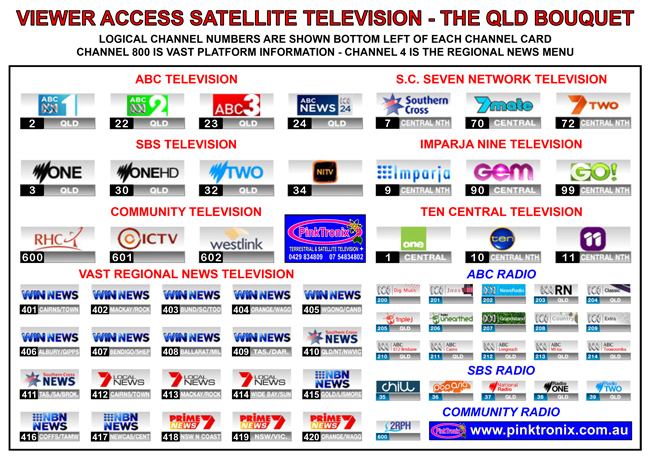 Viewer Access Satellite Television - Overview - VAST installation services by Pinktronix, Gympie, 4570. The service was put in place by the government and commercial TV companies to fill in the TV black spots for the whole of Australia. The VAST service is free after installation. Since being made available to the public on the 15th December 2010 VAST has become a household name for travellers and people living in T V black spots. It is a huge improvement on the previous Remote Area Broadcast Service which had less channels and was not truly oriented towards being a national service. Area specific programming is delivered to the public by what VAST Administration refer to as bouquets. In the 4 years since those early transmissions the service has evolved from a second class cousin of FTA terrestrial to being the preferred service, if you are an avid watcher of ABC and SBS. 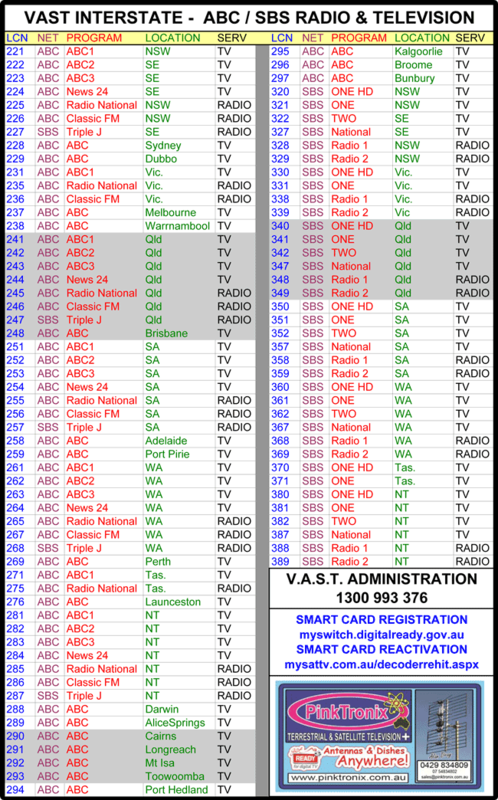 As the ABC/SBS channel guides below show, there are several repetitions of ABC and SBS through the time zones. This can be a very handy feature, as you can, in effect time shift viewing almost as if your decoder was a Personal Video Recorder..
For example if you start watching Q&A on east coast ABC and are interrupted then all you have to do is switch to a broadcast in a later time zone to pick up the threads again. Or you could watch the program you missed on the east coast by simply picking it up on the west coast. Also, now that most decoders are PVR ready, the different time zone transmissions allow you to record ABC and SBS programs with a less chance of overlap in recording time of day selection. The service transmits in DVBS2, standard/high definition format and offers 5.1 sound when carried with the program. All VAST decoders have a HDMI port and either an optical port or RCA jack, or both for the surround sound. Backward compatibility is provided for with the inclusion of olde component video, and real olde CVBS, (yellow composite video), RCA jacks. The red/white stereo pair carry the analog sound. Most decoders have a time shift PVR function with some PVR models offering "Record one / watch another" functionality. The viewer will be assigned a viewing plan, or "bouquet "of channels after registration with VAST Administration. This viewing plan will be keyed to your location if static, or your itinerary if a traveller. Travellers may request activation of different bouquets as they move around the country. A “box hit” keyed to your smart card / decryption module in your decoder, and thus, to your viewing plan, (static or traveller), will allow decryption of the channels appropriate to your registration in much the same way program access is controlled with Foxtel or any other subscription TV provider. This protocol is called Conditional Access in media encryption jargon. 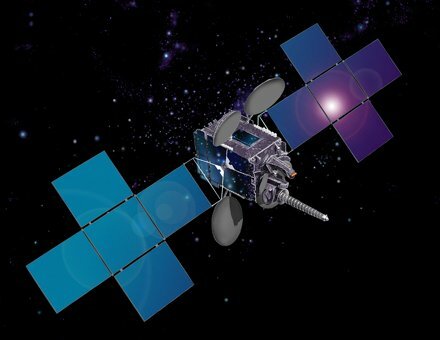 The "box hit" or decryption signal is sent from the VAST satellite's earth station, (an Optus teleport in Belrose, Sydney), to a VAST satellite in orbit, ( Optus C1 / Optus D3) and then retransmitted from that VAST satellite to the VAST customer dishes on earth. Upon request from VAST Administration. Upon request from the user via a VAST administration "box rehit" internet portal accessible to the public. Automatically every hour via the Optus Network Operations Centre. This is done to refresh the decoder software and maintain the activation status of each registered decoder. Thus, upon access expiry, all the user will be able to view will be the unencrypted information channels and the tune channel, (800, 802 and 801 respectively), until receipt of either the computer portal rehit, the automated hourly rehit or a rehit initiated by VAST Administration. A message advising this viewing status will be present on the relevant channels. Source: VAST Administration. April 2014. You will need to register your decoder smart card with VAST administration in order to have the "box hit" transmitted. Travellers please note; that if your 6 monthly registration for the VAST service has expired, a box rehit will not reactivate your service. You will need to re-register with VAST administration first.